Depicting Ted Kennedy’s involvement in the fatal 1969 car accident that claims the life of a young campaign strategist, Mary Jo Kopechne. 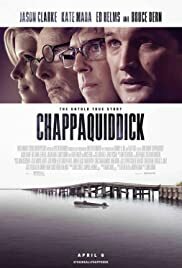 CHAPPAQUIDDICK is a story not many non-Americans are familiar with. If this is not a story that needs be told, and if it is not an interesting one, it is one that questions the right thing that human beings should do. The story has also been given a TV movie treatment a few years back, only now a full feature treatment. A story that deals with a tragedy and with a character that is a coward relying on others to cover up his bad deeds is hardly material Hollywood would be interested in. But the story is told with a twist, where the main character finally redeems himself and proves to others that he is a decent human being. This character is Senator Ted Kennedy. The film set in 1964, is also a meticulously crafted period piece with vintage vehicles. The accident of the car going over the bridge into the water (a repeatedly visited scene) is well executed. Presidents of the United States have always lied when confronted with catastrophe, Nixon and Clinton being the best examples. This film questions the integrity of Ted Kennedy, which is correctly chosen to be the subject of the film. This suspenseful historical drama examines the infamous 1969 incident when Senator Ted Kennedy (Jason Clarke) accidentally drove off a bridge, resulting in the death of campaign worker Mary Jo Kopechne (Kate Mara). This become known as the Chappaquiddick Incident. Kopechne was trapped in a car that Senator Ted Kennedy drove, following a night of festivities. Kennedy patriarch Joe (Bruce Dern), however, always considered his youngest son a ne’er-do-well — and he never let Ted forget it. The party on Chappaquiddick reunited the “Boiler Room Girls” who had served on Robert Kennedy’s 1968 presidential campaign, among them Mary Jo (Kate Mara). Ted whisks Mary Jo away for a reckless moonlight drive that ends in tragedy. But the more profound malfeasance begins after the drowning — itself dramatized here in harrowing detail — when a battalion of spin doctors gets to work on covering up the incident, using the Apollo 11 moon landing as a distraction. The acting honours go to veteran actor Bruce Dern as the patriarch of the Kennedy family. Joe is wheelchair ridden and unable to speak due to a stroke. His mannerisms and utterings bring a different perspective to the story. Jason Clarke is also marvellous is the role of Ted Kennedy, evoking our anger in the beginning and later earning the audience’s sympathy even forgiving him. The film clearly stays clear any material dealing with the possible affair between Kennedy and Mary Jo. The film also avoids any issue with Kennedy’s wife, she only said to be not feeling well during the events. Near the end of the film, however, director Curran allows multiple opinions to be voiced through staged interviewees on camera. One lady accurately says, that not all the facts are revealed so the public never knows the whole story.